DeSean Jackson left Sunday's game against the Dolphins with a hamstring injury. 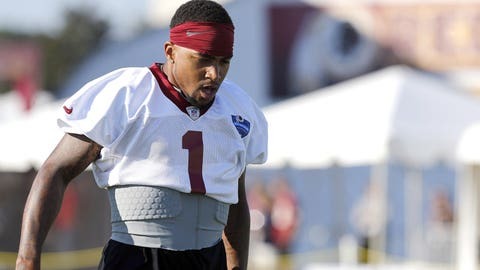 For the majority of the 2015 preseason, Washington Redskins wide receiver DeSean Jackson was out with a shoulder injury after running into a blocking sled at practice. On a late first quarter go route down the right sideline Sunday against the Dolphins, Jackson pulled up lame on an overthrown pass from quarterback Kirk Cousins. Jackson was seen on the sideline being stretched out by trainers before heading to the locker room. After being evaluated by team doctors, Jackson has been ruled out for the remainder of Week 1 with a hamstring injury. The Redskins will move forward with Pierre Garcon, Andre Roberts and a combination of Jamison Crowder and Ryan Grant. Jackson caught 56 passes for 1,169 yards in 2014, his first season with the Redskins. He led the league with an average of 20.9 yards per catch.